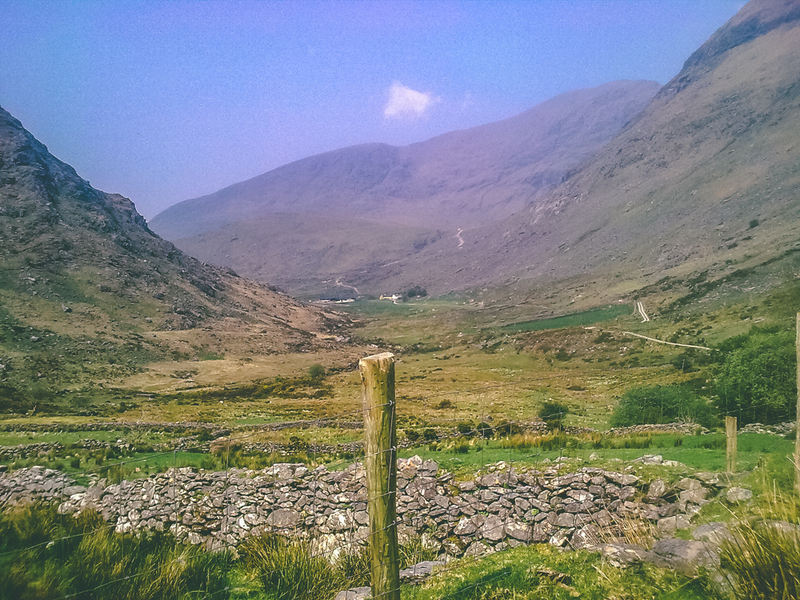 After taking on the Western Way last year for the inaugural Survivor Paddy, this year we decided to head to the south-west and hike the northern section of the Kerry Way over the May bank holiday weekend in 2011. With a larger contingent of eight eager Paddies in tow we arrived in Killarney on the Thursday eve and checked into the Railway Hostel. After dropping our rucksacks up to the dorm we got in some late grub in the town followed by a couple of pints to calm the excitable anticipation of the few days ahead. Back in the hostel before bed, the discussion revolved around the weight of each respective kit, with a few feeling theirs, and some others, to be on the heavy side. The Friday morning was the perfect time to get out into the wildness as the Killarney International Rally of the Lakes was taking place over the same weekend. So we left the town, heading out along the Kenmare Road and then crossed into the picturesque grounds of Muckross House and the periphery of Killarney National Park. On our western flank as we walked were two of Ireland’s finest lakes, Lough Leane and then Lough Muckross, both set in the foreground of the famous Macgillycuddy’s Reek Mountains. Leaving the demense, we crossed back over the Kenmare road a few kilometres into the walk and took the stepped track up towards Torc Waterfall. Passing the waterfall, the track, now overlain with railway sleepers, opened out from an area of mature deciduous forest into an upland plateau of blanket bog. The first sense of wilderness came to us here. Coming down off the plateau we traversed the Kenmare Road again and entered into Derrycunnity Wood which borders the southern shore of Lough Muckross. From there the group hiked on towards the semi-wilderness of Black Valley, stopping only for a dip in the river and some other river-related antics along the way. 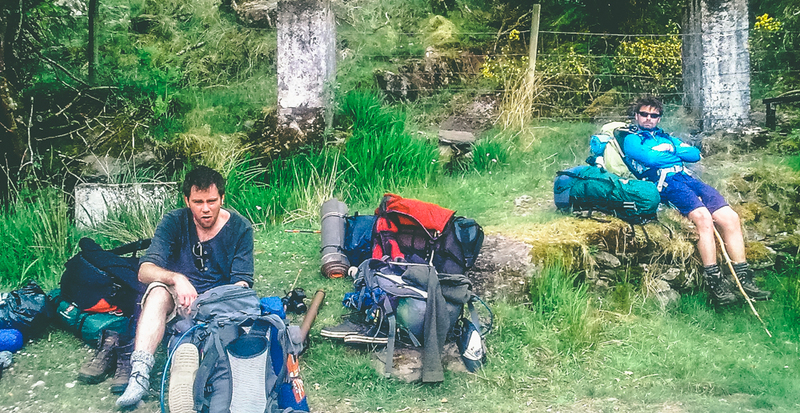 By evening time, the weight of the rucksacks wore heavily on one or two of the party and the pace notably decreased. Although a few Paddies were still in fine fettle and kept the collective spirit raised as sun waned in the sky. Despite all this, it took another couple of hours to identify a suitable area to camp for the night with an advanced party going ahead of the hiking peloton and foot-sore stragglers. A very suitable campsite was located on the shores of Lough Cumeenduff . To get there involved jumping some barbed wire and then a steep hike down off the main track along the edge of a coniferous forest. 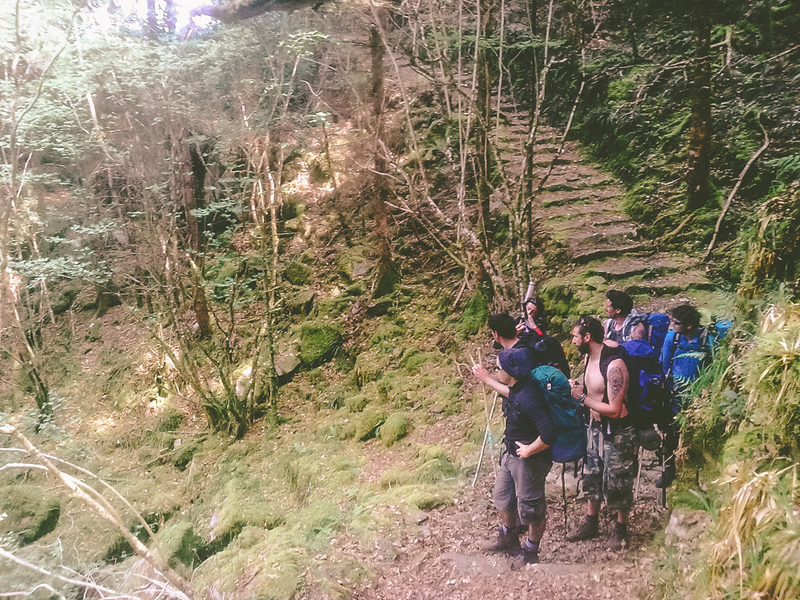 Ditching the heavy kit was a simple rewarding pleasure as we knew this was it hiking-wise until the next morning. There was plenty of firewood, a good shore to fish from and even take a refreshing dip in. One or two bags were lightened as some steak fillets were produced and cooked up over the burning embers of the camping fire. The craic around the fire was good as the night set in and the last person retired to their tent around 2:30am. Distance walked 24 km. Leaving camp around 10am, the group got back on the track after a steep uphill hike and eventually made headway over the spectacular elevated wild and rocky pass from the Black Valley into the Bridia Valley. Having walked through the remote valley, we climbed up through another pass along a sheep trail and followed the track down along a fast-flowing, cascading river which eventually led us to turn left onto a long and weary road to Glencar village. 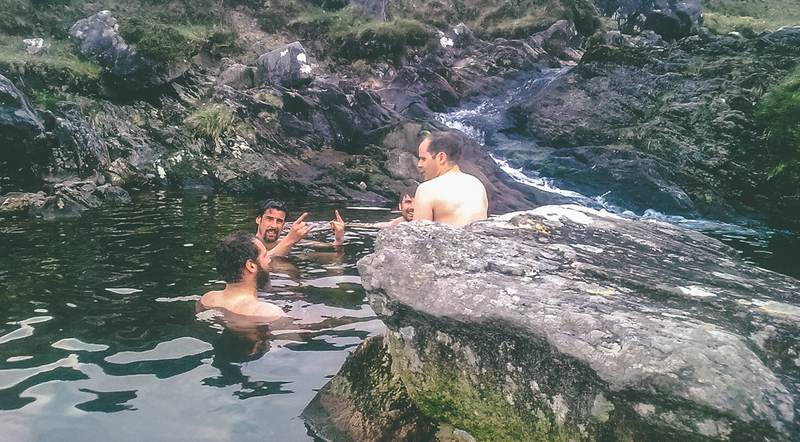 In the interim, the river proved to be an ideal stop to take a break, and jump into the deep natural, pools of water. On the road into Glencar, one of the troops was suffering quite badly underfoot from blisters which developed the day before and unfortunately mechanised transport (aka a taxi) had to be hailed by satellite phone (okay mobile phone)‘to evac’ him out directly to the hostel in the village. In credit to him, he had honourably persevered throughout the day and the previous afternoon in aching pain so there was no dishonour in succumbing at this time. After what seemed like an age, the rest of the group made it to Glencar village around 6 pm and we broke survivor protocol to have a couple of ciders and sit outside the pub there as the sun set. Camp was set up near the hostel and a roaring fire was lit which was not put out until the early hours. This was the final leg of our hike. From Glencar village we hiked over the day to our final destination of Glenbeigh. The hiking took us through some magnificent forestry and at one point along the Caragh River where we stopped for a spot of fishing and cooked up the last of our rations on the exposed river bank. The mountain trail through the Windy Gap was also spectacular. The Sunday evening was finished off in Glenbeigh, where we all tucked into some much anticipated creamy Guinness on arrival, scrubbed up and ate some grub back in relative civilisation. Distance walked 16km. 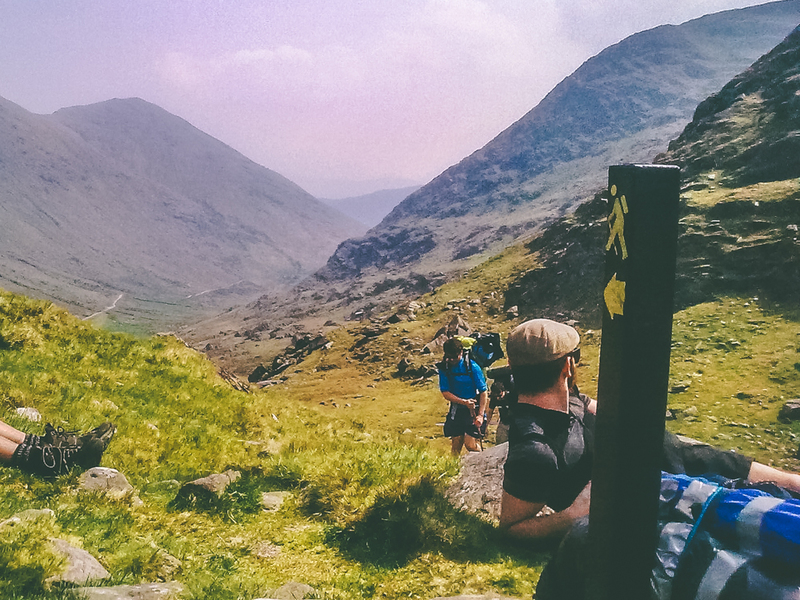 All in all a great 3-day hike in a beautiful part of Ireland. Another Survivor Paddy where the weather held up and it was still only the beginning of the summer. The camaraderie among the group along the way and each evening was very enjoyable too. This is becoming an annual thing I think. Roll on next year.